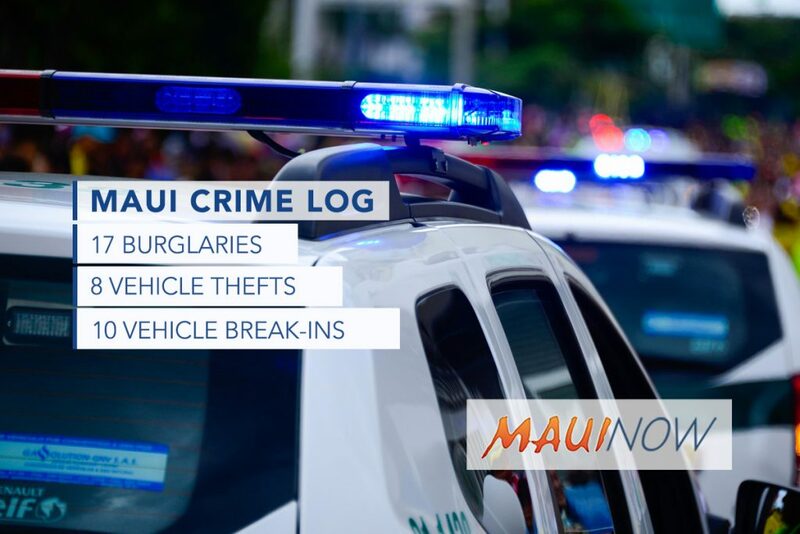 Crime log, Jan. 20-26, 2019. 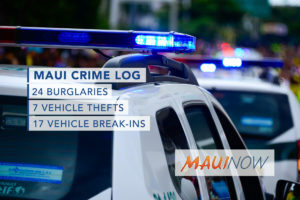 Maui police responded to 14 burglaries, 14 vehicle thefts and 27 vehicle break-ins in Maui County over a seven day period from Jan. 20-26, 2019. Burglaries were up, vehicle thefts remain unchanged, and vehicle break-ins decreased slightly from week before levels. Burglaries were up +55% from the week before when 9 incidents were reported over the seven day period. Vehicle thefts were unchanged from the week before when 14 incidents were reported; and vehicle break-ins dropped slightly -3.5% from the week before when 28 incidents were reported. Of the 14 vehicle thefts reported, seven have since been recovered. Wednesday, Jan. 23, 7:52 a.m.: 600 block of S Oʻahu St, Kahului. Residential, unlawful entry. Wednesday, Jan. 23, 2:44 p.m.: 111 Kahului Bch Rd, Kahului at Harbor Lights. Residential, unlawful entry. Monday, Jan. 21, 7:09 a.m.: Honoapiʻilani Hwy/Mahana Ridge St, Kapalua. Non-residential, forced entry. Sunday, Jan. 20, 11:37 p.m.: 800 block of Mahealani St, Kīhei. Residential, attempted entry. Monday, Jan. 21, 6:53 a.m.: 800 block of Mahealani St, Kīhei. Residential, attempted entry. Monday, Jan. 21, 1:54 a.m.: 600 block of Piliwale Rd, Kula. Non-residential, attempted burglary. Monday, Jan. 21, 7:24 a.m.: 800 block of Front St, Lahaina. Non-residential, unlawful entry. 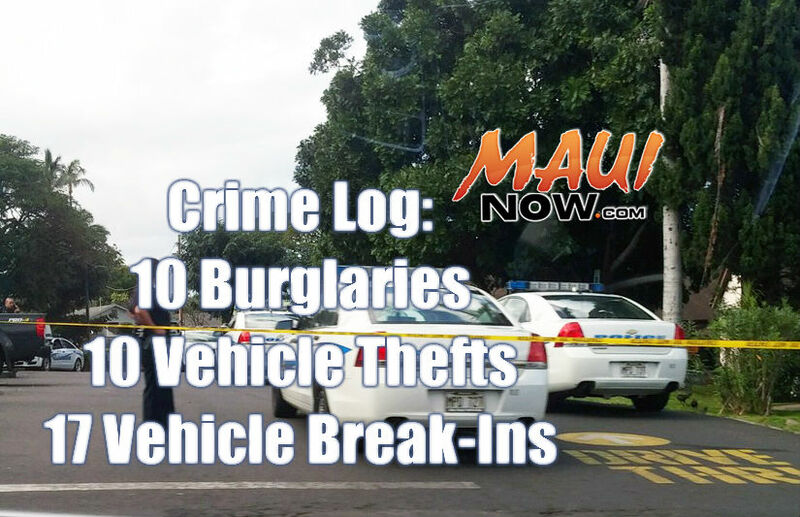 Thursday, Jan. 24, 8:31 a.m.: 715 Front St, Lahaina at Lahaina Sunglass Co. Non-residential, forced entry. Saturday, Jan. 26, 8:42 a.m.: 671 Front St, Lahaina at Lahaina Henna. Non-residential, unlawful entry. Wednesday, Jan. 23, 3:50 p.m.: 600 block of Pohala St, Waiehu. Residential, unlawful entry. Monday, Jan. 21, 9:08 p.m.: 1100 block of L Main St, Wailuku. Non-residential, unlawful entry. Tuesday, Jan. 22, 12:10 p.m.: 55 Mahalani St, Wailuku at Maui Police Department. Residential, forced entry. Wednesday, Jan. 23, 5:04 a.m.: 1010 L Main St, Wailuku at ʻOhana Pawn LLC, Unit B. Non-residential, forced entry. Friday, Jan. 25, 6:33 a.m.: 122 S Market St, Wailuku at Wells Park. Non-residential, forced entry. 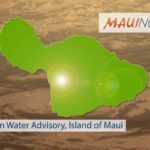 Thursday, Jan. 24, 10:35 a.m.: 1700 block of Kauhikoa Rd, Haʻikū. MRJ077 2007 Chevy Equinox, gray. Monday, Jan. 21, 10:58 p.m.: 2435 Kāʻanapali Pkwy, Kāʻanapali at Whalers Village. LGD244 1997 Honda Civic, black. Tuesday, Jan. 22, 7:18 p.m.: 275 Kaʻahumanu Ave, Kahului at Sears parking structure 3rd level. LAG399 1995 Mazda B23, black. Thursday, Jan. 24, 11:06 p.m.: 275 Kaʻahumanu Ave, Kahului parking lot between Starbucks and Fernandos. M00577 0 DAIX, red. Friday, Jan. 25, 2:57 p.m.: 275 Kaʻahumanu Ave, Kahului at Queen Kaʻahumanu Center. MEY011 1999 Honda Odyssey, gold. Saturday, Jan. 26, 8:53 a.m.: Kaʻahumanu Ave/Kahului Bch Rd, Kahului. 0, red/black. Friday, Jan. 25, 5:33 a.m.: 100 block of Ponanā St, Kīhei. LEG579 1999 Toyota 4Runner,silver. Friday, Jan. 25, 5:33 a.m.: 100 block of Ponanā St, Kīhei. LFH619 2013 Jeep Wrangler, maroon. Friday, Jan. 25, 11:09 a.m.: 100 block of Mokuahi St, Makawao. 0 Toyota Tacoma, yellow. 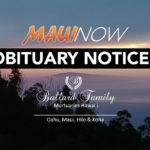 Sunday, Jan. 20, 9:51 p.m.: 4401 L Honoapiʻilani Rd, Nāpili at Hololani Resort. 693XNN 2010 HD motorcycle, black. Sunday, Jan. 20, 8:30 p.m.: 120 Baldwin Ave, Pāʻia at Pāʻia Post Office. MJR301 1998 Honda Accord, white. Wednesday, Jan. 23, 8:29 a.m.: 700 block of Kōlani Pl, Waiehu. LGM017 2001 Ford Ranger, white. Sunday, Jan. 20, 7:42 a.m.: 5200 block of Mākena Rd, Wailea. RND945 2005 Toyota Tundra, gray. Tuesday, Jan. 22, 6:12 a.m.: 2000 block of Pakahi St, Wailuku. MAS543 1994 Toyota, green. Saturday, Jan. 26, 10:19 p.m.: 900 Hāliʻimaile Rd, Hāliʻimaile at Hāliʻimaile General Store. 2015 Toyota Rav4, white. Sunday, Jan. 20, 5:48 p.m.: 12300 Hāna Hwy, Hāna at mile 23. 2017 Ford Explorer, white. Monday, Jan. 21, 4:16 p.m.: 540 Haleakalā Hwy, Kahului at Costco parking lot. 2018 Jeep Grand Cherokee, maroon. Monday, Jan. 21, 8:21 a.m.: 340 Dairy Rd, Kahului at McDonalds. 2014 Acura MDX, silver. Monday, Jan. 21, 12:54 p.m.: 214 Hoʻokele St, Kahului at Lowes. 2004 Ford Mustang, blue. Tuesday, Jan. 22, 12:51 p.m.: Kaʻahumanu Ave / S Papa Ave, Kahului. 2007 Mazda MZ6, gray. Tuesday, Jan. 22, 12:51 p.m.: Kaʻahumanu Ave / S Papa Ave, Kahului. 2003 Honda Accord, silver. Wednesday, Jan. 23, 5:38 p.m.: 275 Uhu St, Kahului at Kahului Community Center. 1997 Toyota Tacoma, white. Thursday, Jan. 24, 8:50 p.m.: 200 E Kamehameha Ave, Kahului at Ross. 2014 Honda Civic, black. Thursday, Jan. 24, 7 a.m.: Ala Luina St, Kahului at Kahului Harbor. 2004 Chevy, yellow. Saturday, Jan. 26, 5:10 p.m.: Alahao St / Kaʻa St, Kahului. 2007 Ford F25, white. Saturday, Jan. 26, 7:08 p.m.: 32 Hoʻokele St, Kahului at Planet Fitness. 2006 Chevrolet, white. Sunday, Jan. 20, 12:11 a.m.: 100 block of Laumakani Lp, Kīhei. 1999 Ford Ranger, gold. Monday, Jan. 21, 1:02 p.m.: 145 N Kīhei Rd, Kīhei at Sugar Beach Resort, ground level parking garage. 1999 Toyota Tacoma, white. Wednesday, Jan. 23, 7:57 a.m.: 100 block of Heona Pl, Kīhei. 2014 Toyota Prius, green. Wednesday, Jan. 23, 7:57 a.m.: 100 block of Heona Pl, Kīhei. 2012 GMC Sierra, black. Thursday, Jan. 24, 1:13 p.m.: Kinaʻole Cir / Ohukai Rd, Kīhei. 1994 Jeep, blue. Thursday, Jan. 24, 6:36 p.m.: 233 Piʻikea Ave, Kīhei at Minit Stop. 2010 Dodge Stratus, black. Friday, Jan. 25, 8:20 a.m.: 100 block of Heona Pl, Kīhei. 2017 Acura TSX, white. Friday, Jan. 25, 8:20 a.m.: 100 block of Heona Pl, Kīhei. 2017 Toyota Tacoma, black. Saturday, Jan. 26, 1:56 p.m.: 2120 ʻIliʻili Rd, Kīhei at Cove Park. 2018 Nissan Versa, silver. Tuesday, Jan. 22, 5:27 p.m.: 840 Waineʻe St, Lahaina at No. 1 Chinese BBQ. 2007 Toyota Tundra, black. Saturday, Jan. 26, 9:17 a.m.: Alawai Rd, Pāʻia at Baldwin Park. 1998 Honda Accord, multi-color. Monday, Jan. 21, 1:47 p.m.: 100 block of Ehilani St, Pukalani. 2004 Toyota Tundra, white. Friday, Jan. 25, 7:12 a.m.: 800 block of Kupulau Dr, Wailea. 1999 Volkswagen Jetta, white. Friday, Jan. 25, 7:12 a.m.: 800 block of Kupulau Dr, Wailea. 2001 Volkswagen Jetta, red. Thursday, Jan. 24, 2:43 p.m.: 359 N Market St, Wailuku at Takamiya Market. 1989 Toyota Corolla, gray.